Polycon Water Bin Containers & Trolleys are Environment Friendly. The containers are rotationally molded from high resistance UV Stabilized polyethylene. It is seamless, one piece construction which gives a smooth surface and easy to clean. 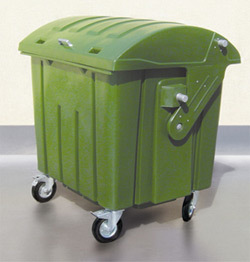 Polycon Water Bin Containers are recyclable, shock resistant & weatherproof. No maintenance, no dents and no colour fading. It is available in standard Olive Green Colour. Custom colour and screen printing company logo can be arranged upon request.